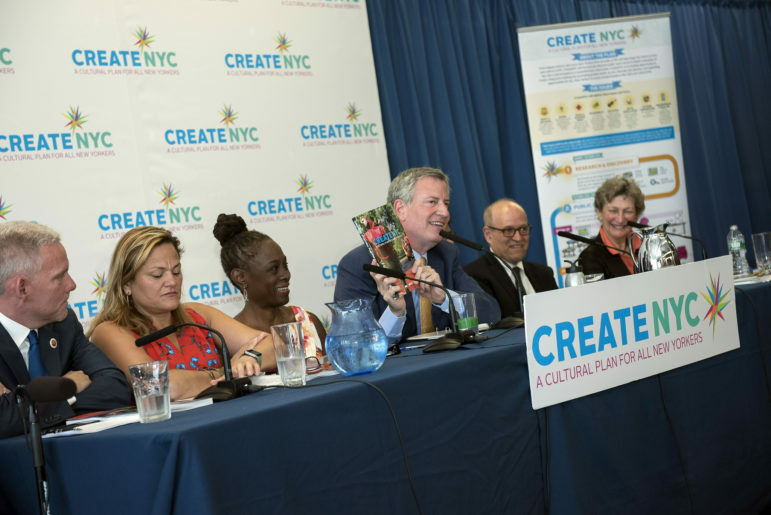 Mayor Bill de Blasio and First Lady Chirlane McCray hold a media availability to announce CreateNYC, the City's plan to expand access to cultural institutions and the arts on July 19, 2017. Over the past year, more and more New York City arts institutions, driven by a powerful movement of artists and advocates, have begun to address the historic exclusion of people with disabilities as artists, performers, cultural workers and audience members. And that means Gregg Mozgala is busy. In recent months, Mozgala, who has cerebral palsy, has been called on to help the Yale School of Drama update its infrastructure and resources after the school accepted its first student with cerebral palsy. He has worked closely with Queens Theatre to prepare the “Theatre For All Short Play Readings” series, which premieres Nov. 18, and he has focused on his own company’s work developing a trilogy of plays based on the myth of Hephaestus, the Greek God of fire and the only god with a disability in the pantheon. Along the way, Mozgala has made sure to document the process as a resource for other institutions and organizations to follow. About 15 months after the DCLA introduced the plan, artists with disabilities and their advocates say CreateNYC has uplifted the community’s long-standing efforts to gain recognition and opportunities. They point to specific measures, like a disability artistry grant and more borough-based art council funding, as well as efforts by individual institutions to feature work by artists with disabilities. They also say the city must make its commitments to funding disability artistry permanent and more deliberate. In August, the Department of Cultural Affairs (DCLA) announced the 22 recipients of the first-ever CreateNYC Disability Forward Fund, a pilot $640,000 grant that funds programs or initiatives to engage artists, cultural workers and audience members with disabilities at 22 arts organizations around the city. Each individual grantee received between $10,000 and $35,000. Mozgala says the fund was an “important first step” for the city. The Queens Theatre, where Mozgala is preparing for the Theatre for All Short Play Readings, was one of of the grant recipients. Manhattan-based Gibney Dance received a grant to fund its annual five-day boot camp for artists and cultural workers from various organizations and institutions. The program educates attendees about how to include and accommodate artists, workers and audience members with disabilities. The workshop also fosters a strong network among attendees who have begun implementing what they learned at their own institutions, including major sites like the art spaces at Lincoln Center, says Kara Gilmour, the senior director of Community Action, Training, and Artist Services at Gibney Dance. To Gilmour, the grant demonstrates that the city has begun putting its money where its mouth is when it comes to disability artistry. The Disability Forward Fund also awarded a grant to Theater Breaking Through Barriers (TBTB), which is using the money to expand its annual Playmakers Intensive, a weeklong program that unites actors with directors with disabilities and gives them rehearsal space to create a short play. The DCLA fund has enabled TBTB to afford more rehearsal time and to pay its participants, who are professional actors and directors. Nicholas Viselli, the artistic director at TBTB, says that he has noticed significant progress in the three years since the city began listening to artists with disabilities during the CreateNYC development process. For example, he says, more casting directors and companies now seek to hire artists with disabilities to play characters with disabilities. “It’s sad when you think of how many plays, movies and TV shows would hire non-disabled people to play disabled roles [and] who were winning awards for it,” Viselli says. Last year, artists with disabilities told City Limits that they were often cast as elderly characters because they use walkers or appear frail. Both Haddad and Viselli say the ultimate goal is for companies and audiences to cast artists with disabilities in roles not written specifically for characters with disabilities. DANT co-director Kevin Gotkin praised the city for devoting money specifically to artists with disabilities, but he says he worries that the pilot fund did not include ways to study and measure the implementation, which is important for sustainability and for motivating the city council to make funding permanent. He says DCLA introduced the grant somewhat haphazardly by giving organizations just over three weeks to apply near the very end of the fiscal year. The short window and vague guidelines favored larger organizations with dedicated development staff and excluded many organizations and artists, he says. During the CreateNYC development phase, DANT proposed a fund that would specifically cover expenses particular to disability artistry, like paying the care workers who may accompany an artist as they install an exhibition or the cost of American Sign Language interpretation for a performance. Such expenses can discourage organizations from working with disabled artists, Gotkin says. “We really need ten funds supporting different kinds of disability artistry,” he says. Nevertheless, the city’s emphasis has helped elevate a movement among people with disabilities who have long demanded recognition, he says.